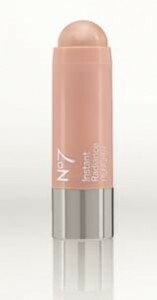 We try out No7’s latest addition to its Christmas collection, the Instant Radiance Highlighter. We don’t know about you, but when party season rolls around, we look at our make-up collection in a whole new light. We don’t want our make-up to cover and conceal – we want it to enhance and shine. Enter the party season essentials: a glittery nail, dramatic smokey eyes, burgundy lips and a beautiful shimmering complexion. For us, this means a good quality highlighter is a must. In the past, we’ve been fans of liquid formulas, dabbing spots in all the right places for a subtle sheen – but when No7 got in touch about their latest stick applicator highlighter, we were intrigued. Having used the brand’s skincare range previously – we were aware that No7 (Boots’ own brand) know their stuff when it comes to the complexion. And indeed, this knowledge shines through with this highlighter (if you’ll excuse the pun). When we tried out the Instant Radiance Highlighter the first thing that struck us was the ease of application. The twist-top applicator offers just the right amount of shimmer and barely needs any blending to look natural. The sheen itself is light and dewy, making it ideal for those after a more subtle look – and for those occasions when you really want to shine, layering up the highlighter with multiple swipes works a treat. The compact size also makes it easy to pop in your clutch for touch-ups during the night – and with a solid formula, you don’t risk a bag-ruining spillage, bonus! Other items in the Christmas Collection include a silver shimmery eyeshadow, a radiance blush palette and some party-ready nail varnishes. The highlighter costs a wallet-friendly £9.95 and can be purchased here or in Boots stores.